Today I have a Spanish beer thatÂ proudlyÂ states its origin of Barcelona and the year 1876 that I probably wouldn’t be reviewing if it hadn’t been given to me. Of the beers we were provided as part of Lake Wine & Spirits‘Â Citizen Six pack this was certainly the one I was the leastÂ optimisticÂ about. Though at the same time I am happy to have the opportunity to sample it as I have never had a beer from the brewery S.A. Damm and I probably wouldn’t have ever gotten around to purchasing this beer even though I see it on the shelves of plenty of retailers. While poured into a tulip as I always prefer, I have poured this beer straight from my 37 degree fridge and will be consuming it much colder than I would other brews as is intended for the style. When poured down the center of the glass one finger of bright white head was produced and started fading rather quickly though left a somewhat surprising ring ofÂ residualÂ carbonation. Color is as pale as they come looking quite like sparkling cider. Carbonation slowly bubbles up to the surface at a constant rate creating a surprisingly attractive presentation. Aroma is of sweet light grains, honey, lemon and some sweet earthy yeast esters. Flavor is of alcohol, paleÂ cerealÂ grains, soft citrus and a modest caramel character. Body is light and mouthfeel is well carbonated though I also find it a bit sticky. 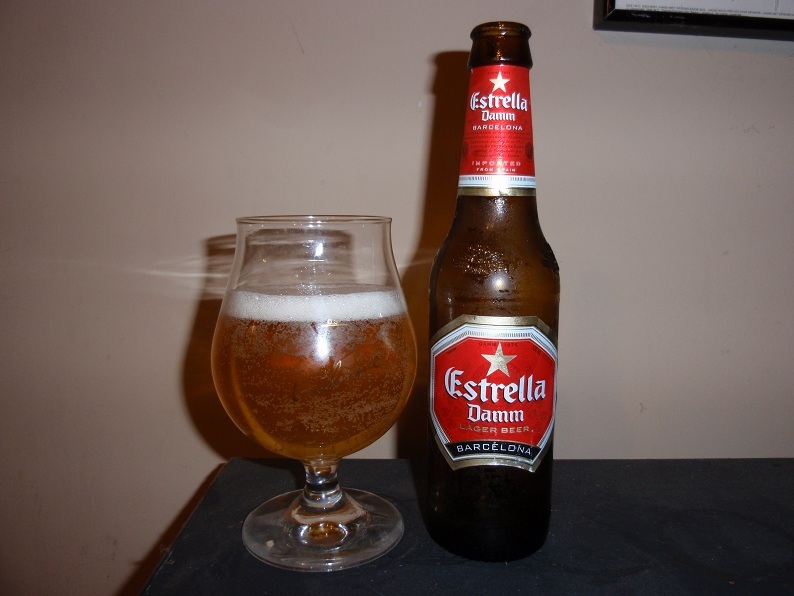 Estrella Damm reminds me a lot of the many Light Lagers available throughoutÂ Europe that I sampled many years ago when I was firstÂ gainingÂ proper respect for beer. While not a beer I would seek out I do appreciate the variety of cereal grain esters present in Estrella Damm. I also particularly enjoy the niceÂ citrusÂ hop character that reminds me a bit of a quality Pilsner, though not quite as bright. At 5.2% ABV this brew is a bit stronger than most American examples of the style but it still very sessionable.Â DefinitelyÂ not a bad beer, and something that I would happily drink over mass produced American (and many European) Light Lagers. If you enjoy Light Lagers and are looking for something that resembles a classic European example this brew is something that you should enjoy.Â DefinitelyÂ a good beer for a hot day in the sun. Also something that you could easily serve most anywhere with out worry of offending peoplesÂ palate. Give it a shot and ride your bike.